A neo-Grecian brick chapel of some size, and typical of its date of 1861, Beccles Baptist church sits on Station Road among the new middle class villas built when the railway came. Faded block letters on the pediment read THE MARTYRS' MEMORIAL, of which more in a moment. The church was probably built by the Particular Baptist congregation who, ten years earlier at the time of the 1851 census of religious worship, had a chapel on London Road. The old chapel had a capacity of about 400, and George Wright the minister claimed it was full both morning and evening. Thus, presumably, the need for a new chapel. This new chapel has itself been extended recently to the rear by the Whitworth Partnership, a sign of its continued growth. 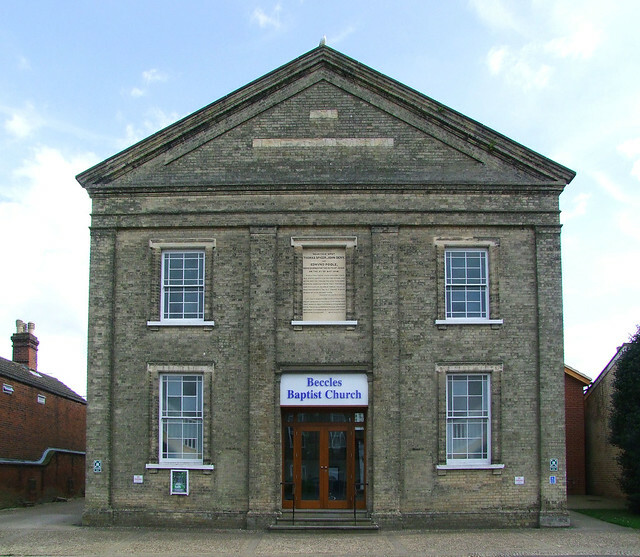 To the casual observer, the most interesting thing about Beccles Baptist church is the large tablet set above the main entrance. It reads Near this spot Thomas Spicer, John Deny and Edmund Poole were burned for the Faith of Jesus, on the 21st May 1556. It continues with a typically mawkish and flowery quotation from Foxe's Actes and Monuments, as well as from the Book of Revelation. 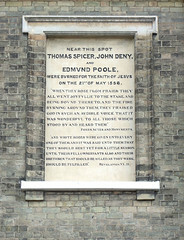 Spicer, Denny and Poole were from the Debenham area, and were arrested under the orders of Sir John Tyrrell of Gipping and brought to Eye prison for refusing to conform to the re-established Catholic church. After a trial for heresy under the Chancellor of the Diocese of Norwich at Beccles, the three were burned at the stake together in Beccles market place. It was the first trial under the new act in the Norwich Diocese, and Foxe maintains that the Chancellor was in floods of tears as he delivered the verdicts and sentences. A century later, the Denny family were significant puritans involved in enforcing Cromwellian law in Suffolk.